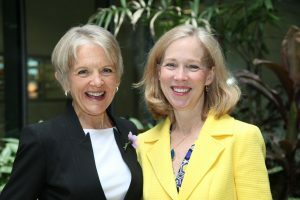 June Alexander and Professor Cynthia Bulik – helping to launch the Anorexia Nervosa Genetics Initiative in 2013 was one of the happiest days of my life. My eldest grandson, aged nine, and I are walking home from the local shops, enjoying a little ‘us’ time, when he pops this question, out of the blue. I pause in my step. Almost drop my bundle. This little scenario is one big reason why I seek your support in this call for donating blood. His beautiful brown eyes are searching my face for an answer. My mind is racing. Six months have passed since I was discharged from hospital. Yes, I had been admitted for a long time. Almost four months. Has my grandson been wondering all this time? Has another adult said something to him? Recently his other grandmother, ‘Nan’, a keen sportswoman, has had shoulder and knee reconstructions, and his Grandpa George has had a knee reconstruction. Nan and Grandpa exhibited physical evidence of their hospital admissions, with slings and crutches and physiotherapy appointments. While I sat in bed and looked pretty ‘normal’. My grandson has his head on one side, his gaze penetrating, waiting. The truth, June. Tell the truth. ‘Yes, I was really sick,’ I say. ‘I didn’t look sick like Nan or Grandpa, but I was sick. ‘Yes, I am much better now. With that, we continue our walk home, our conversation reverting to light-hearted discussion of the toy mice we had just selected in the $2 store to amuse Norah Kitten, the likely football results at the weekend and what is happening at school. My grandson’s question is thumping in my brain, though. Other questions will follow as he grows older, and I want to be ready to answer them, properly and adequately. He has a grandparent who has a mental illness. Me. Until now he has seen me as ‘Grandma’. Period. But now he is starting to look at his place in the family and in the wider world. I want him to feel at ease in asking questions to satisfy his need to know, to satisfy his curiosity. I want to be able to give him the right answers. My grandson’s question is making my heart ache. In two years he will be the age I was, when I developed anorexia. The reality is, effects of anorexia, for me, will not end. It no longer rules my life but the illness that almost took my life affected my marriage, has affected my children. I do not want it to affect my grand children or their children. Twenty-five years ago, I was 40 when youngest son, Ben, in mid-teens, returned from a visit with my parents and said: ‘Mum, they say you are the one with the problem in the family’. Grieving at this feeding of misinformation, my healing regressed for six months. Such setbacks occurred often during my long battle to break free from the prison of my eating disorder. While my healing from Enduring Anorexia Nervosa is well advanced, long term effects and co-morbid mental health challenges continue. They have become easier to manage in my family environment, in that the illness is no longer swept under the carpet like an embarrassing secret, to be ignored, denied, spoken of as ‘a problem’ or weakness in the family. The illness is acknowledged, even if not fully understood, and I’m glad my grandson feels able to ask, ‘Grandma, were you really sick?’, because he obviously has been giving this question deep thought. I would hate for him to be wondering, like I did when I was a kid, and to not be feeling free to seek answers. I just wish I had more answers to give. Especially for my family. Especially as we now know that genetics have a role in the development of eating disorders. For my family of creation is everything to me. I was wondering if we could ask you a favor. You have been the ANGI champion. We have only a few more weeks of recruitment and need a final push in Australia and the United States! Do you have the time/energy to write a “last chance” blog to get people out there to participate? We would just love to be overworked in the last month to really make a final splash! We would be so, so grateful! Prof. Bulik, does a happy kitten purr? Does a hungry kitten meow? Do I have the energy to encourage people to participate in this vitally important research on the illness that has affected generations of my family, and the lives of thousands and thousands of others? Giving a blood sample to help find a cure for Anorexia Nervosa is one of the most meaningful moments in my life. Donating a blood sample for gene research and discovery is one of the most meaningful moments in my life. My blood sample, along with many others, has been collected as part of the Anorexia Nervosa Genetics Initiative. To know I am contributing in a small way to helping researchers find a cure for anorexia nervosa feels good. Really, really good…. 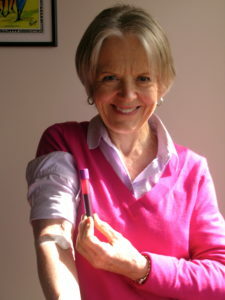 A half century after I developed anorexia nervosa, my blood sample will help find out why. I have cried tears for my parents who are not alive to know about this research. Tears especially for my mother, because she did not understand what happened to me, at age eleven. She did not understand I had an illness in my brain. She certainly did not know part of the reason was genetic. She did not know how to help me. She did not know the real me was suppressed by this illness; she did not know the little girl she knew, but had disappeared, was imprisoned deep inside, crying and trying to get out. So difficult, without a guide to help her, or me. As the years rolled by, misunderstandings became mountains that could not be crossed. I became alienated. Anorexia Nervosa affects the sufferer most but affects, in some way, every member of the family. How many samples in hand to date from participants with history of anorexia? How many more samples are needed? Australia: 200 more participants, who have experienced anorexia at some time in their life. United States: 100 more participants, who have experienced anorexia at some time in their life, and 600 more participants who have never had an eating disorder. What is best contact point in each country? Australia: https://angi.qimr.edu.au, free call 1-800-257-179, or email angi@qimrberghofer.edu.au (there’s a video, a link to the eligibility survey and heaps of info). In both Australia and the United States, the eligibility survey and consent form must be lodged by June 30, 2016. This is to allow time for blood samples to be collected by July 31, 2016. 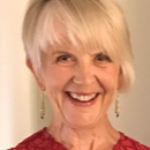 If you have had anorexia at any time in your life, and you live in Australia or the United States, I encourage you to contact Prof. Bulik’s team on the above links. Make your experience count in the quest to find answers and allow us and our children and grand children to live free of this terrible illness. Let’s support Prof. Bulik and her wonderful team of researchers. Let’s make Prof. Bulik and her team more overworked than they already are. They want and need our help to crack the code on the illness that has made our life hell.